The CRWFS included environmentalists, managers of large water districts, farmers and other representatives from the agricultural industry, ecologists, elected and appointed state government officials. For two years I worked with Ag Innovations Network to guide and facilitate the CRWFS. We published our report on “Connectivity” in 2014 year. I want to share 2 brief sections that shine light onto the social change methodologies that underlie the CRWFS and have made it effective for more than 4 years. My work was to design and facilitate the roundtable addressing a specific water and food supply topic deemed of greatest importance. In addition to this my role included what I came to call “guiding their knowledge evolution.” In a nutshell this knowledge evolution begins with framing the topic in such a way that encouraged systemic thinking, then guiding a series of confidential and in-depth dialogues informed by the expertise by the roundtable members and occasionally invited speakers, the use of conceptual models and visuals tools to achieve break through thinking, and finally harvesting the insights, articulating guiding principles and recommendations for action supported by full buy-in by all 25 stakeholders, and then the production of the report and outreach. 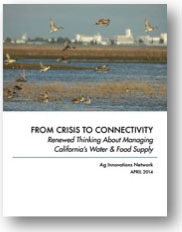 From Crisis to Connectivity: Renewed Thinking About Managing California’s Water and Food Supply outlines a whole systems approach to addressing significant underlying disconnects. 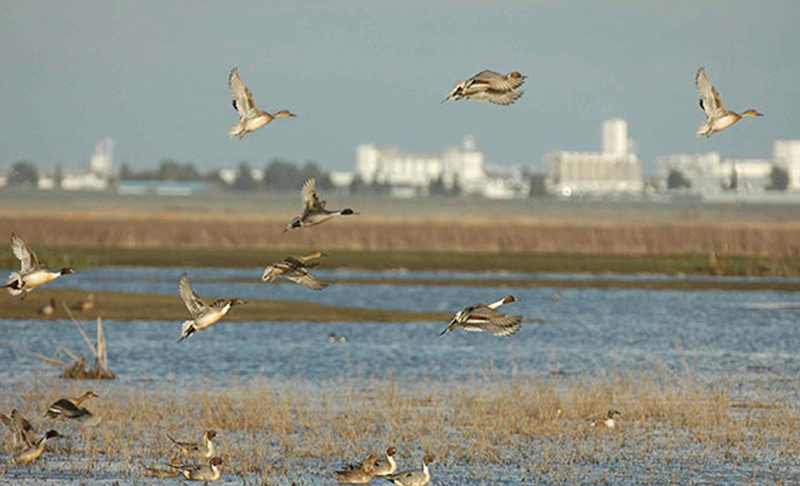 This report also shows that the momentum of moving toward more systemic approaches is already developing within a number of disciplines that inform water resource management, food supply systems and environmental stewardship. 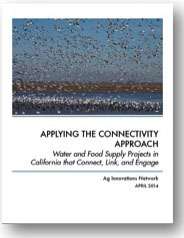 The second report, Applying the Connectivity Approach: Water and Food Supply Projects that California that Connect, Link and Engage shows how several progressive projects in California are already applying the guiding principles put forth in the connectivity approach. Since 2010, the California Roundtable on Water and Food Supply (CRWFS) has been cultivating a systemic approach to understanding and addressing the complex water and food supply issues in California. The results of this approach can be found in the three completed modules: ag water stewardship, water retention in the landscape, and improving connectivity in our water management approach. Underlying this systemic approach, and central to the production of the reports from each module, is the social methodology that CRWFS uses to develop and support the capacity for renewed thinking and leadership among its members. Two critical elements of this methodology are bringing together diverse stakeholders and engaging them in respectful, trusting, and generative dialogue over time. This emphasis on strong relationships across different perspectives and over long time cycles enables a more thoughtful, holistic, and overarching perspective than any one stakeholder could achieve alone. It is within this type of atmosphere that a group of diverse stakeholders are best positioned to understand the needs of the whole system and to develop systemic recommendations, guiding principles, and strategic solutions that can address them. The social methodology used for CRWFS is, in fact, an approach for achieving connectivity. Members connect with one another, work together to identify an approach and guiding principles, and in this way generate the kind of connected thinking and connected-benefit solutions we advocate for in this report. What are the missing, broken, or dysfunctional connections in our water and food supply system? Which are most serious? Are there patterns that cause those systemic failures, and what are they? What reconnections or new connections would effect the most change at this time, and into the long-term future? How do we best conceptualize a framework for connectivity that will help us think about and identify strategies and principles to build a more connected and resilient water and food supply system? What are the guiding principles for building a more effectively connected water and food supply system, and what current projects may already demonstrate these guiding principles in action? Many organizations have willing leaders who want to be open-minded and take seriously the need of other groups and advocate for the needs of the collective. But when issues remain unresolved or people fail to achieve desired outcomes they often default to blaming others and sometimes even question their own abilities to make a difference. This is why so many issues remain unresolved. What is usually missing is a process of engagement that builds trust, confidence and respect between these diverse leaders and a process that taps into the expertise and wisdom that these leaders have. My experience with the CRWFS grew my confidence that successful outcomes in multi-sector stakeholder work can happen with the combination of well thought through and crafted process, careful facilitation, and the support of willing and dedicated leaders who want to make a real difference.